By evaluating the adjacent cardiac chambers, more reliable information of a single-chamber function and inter-chamber compensatory functional mechanism can be acquired. Based on cardiac CT data with multiphase reconstruction, morphometric imaging markers are useful for evaluating the levels of the preload, inotropy, and afterload in each cardiac chamber as well as the global multichamber cardiac function. In clinical practice, the inotropic function and the afterload of left ventricle are major concerns. The left ventricular ejection fraction and the cardiac index are good markers for the inotropy. The left ventricular end-systolic volume index, the peripheral vascular resistance, and the aortic distensibility are useful markers for the afterload of left ventricle. The second major concern may be the afterload of the right ventricle, which can be evaluated by the right ventricular end-systolic volume index, the pulmonary vascular resistance, and the structural deformations. 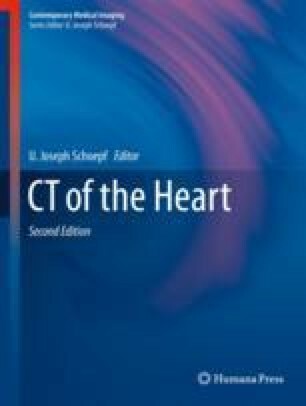 If information about the cardiac function and the chamber volume could be acquired via coronary CT angiography, at the cost of increased radiation dose, it may be useful for clinical management of diverse cardiac diseases including ischemic heart disease, cardiomyopathy, and heart failure.